Here were some of my favorite looks from the 2017 Golden Globes. I loved so many looks this year but narrowed it down to the ones below. Let me know whose look was your favorite in the comments below! I love Gina Rodriguez’s shimmery fringe. She looks fresh and fun with her hair swept to the side rather than being in an updo. It’s the perfect example of Hollywood glamour. I love the embellishment of this dress with the strategic cutouts on the top bust. It’s super modern with a sleek ponytail to show off the glam of the dress. I love seeing white on the red carpet. Priyanka Chopra is one of my favorite style icon, and this was another hit. She makes it more casual and easygoing with a simple dark lip and minimal styling. Some people might not love this look, but it’s totally different from the glitz and sequined gowns. I love how ethereal and romantic this gown was. Elegant, embellished and a showstopper of a gown. It looks like it fits like a glove. Millie Bobby Brown made my best dressed list because it’s easy for someone her age to want something crazy or colorful, but she opted for a very elegant dress instead. This is definitely a statement piece. Some might hate it, but I love how it just screams couture. The lace detailing is super pretty and it’s another piece that breathes romance. I’m going to see The Age of Adaline tonight, and I’m super excited to see Blake Lively in it. In honor of the movie, I thought I would share my ten favorite looks from her. She has a very Hollywood glamour feel to all of her looks, while maintaining her girl next door vibe. Hope you like this post! I thought Emma Stone was the best dressed at the Oscars, and I really love her style in general. She’s always trying new styles and shapes, and her styling is always on point. Below are twelve of my favorite looks from her. You can tell by the photos below that she’s always having fun with fashion. 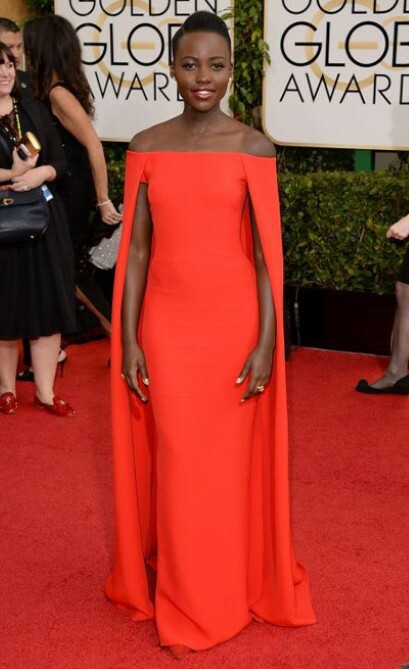 It was so hard to narrow down my top ten favorite looks from Lupita Nyong’o. I just think she has such a glow to all of her looks. I remember seeing her Golden Globe look last year for the first time. Her red caped dress was just a glimpse of what was to come! Follow me and comment below if you liked this post. I’m sharing my thoughts on some of my favorite looks of the Golden Globes! For some reason, I wasn’t loving a lot of the dresses but there were definitely a handful that I absolutely adored. I know some people might have different opinions but this is just my own personal view! Emma Stone: Her Lanvin jumpsuit was bold and yet she came off looking so effortless and relaxed. Her tousled hair and heels were perfect touches. I loved the glamour of the top bodice and the sleekness of the bottom pant and over sized bow. Emily Blunt: Emily’s braided hairdo ultimately elevated the overall look but I also loved her dress. The cross body ruching was by Michael Kors and the color popped beautifully. The real showstopper was the Lorraine Schwartz jewels she paired with her gown. Julianne Moore: Not everyone agrees with this Givenchy gown. I personally love this shimmery gown. I love the shape and the feathery bottom wasn’t too over the top. With minimal styling and her hair down, I thought this look was perfect for the golden globe winner. Heidi Klum: This was a winner for Heidi. The dress has a bold color, ruching, sequins and an asymmetrical neckline and yet, it looks so effortless. The hair screams Hollywood glamour. Quvenzhane Wallis: Little Quvenzhane looks absolutely darling in this Armani gown. It is super adorable and I love the blush color against her skin. Allison Williams: The Girl’s star looked radiant in this Armani Prive dress. The layered dress was risky and could have been a train wreck but the glam hairstyle and makeup made the look a winner for Williams. Naomi Watts: I’m a sucker for a bright yellow and loved this Gucci look! The Bulgari snake necklace was the standout of this look and really elevated my love for this entire ensemble.